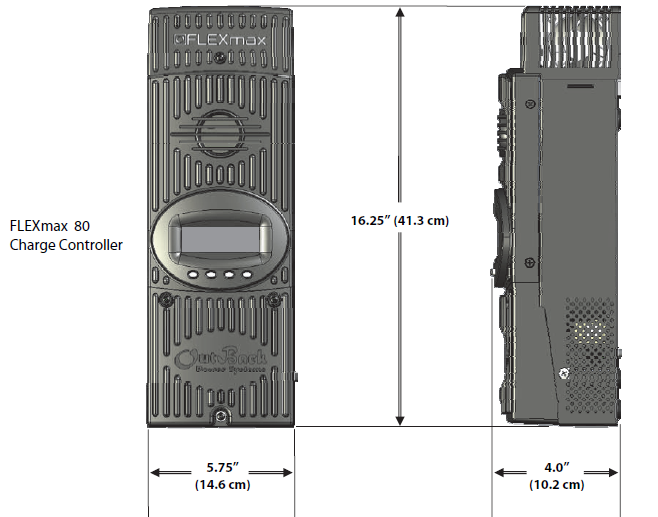 The OutBack Power FlexMax-80 FM80 150VDC MPPT charge controller is the latest innovation in Maximum Power Point Tracking (MPPT) technology. The innovative FLEXmax MPPT software algorithm is both continuous and active, increasing your photovoltaic array power yield up to 30% compared to non-MPPT controllers. Due to active cooling and intelligent thermal management cooling, both FLEXmax charge controllers can operate at their full maximum current rating, 60 Amps or 80 Amps respectively, in ambient temperatures as high as 104°F (40°C). OutBack's FLEXmax-80 MPPT charge controllers are the only choice when you demand a high performance, efficient and versatile charge controller for your advanced power system. Quality Meets Power - Increases PV array output by up to 30%. Advanced continuous Maximum Power Point Tracking (MPPT). Full power output in ambient temperatures up to 104°F (40°C). Battery voltages from 12 VDC to 60 VDC. Communicates & Stores Data Effectively - Fully OutBack network integrated and programmable. Programmable auxiliary control output. Built-in 128 days of data logging. Efficient & Secure - Standard 5 year warranty. Greater than 98% peak efficiency. Click the button below to add the OutBack FlexMax FM80 180A MPPT Charge Controller to your wish list.